Are you on a strict diet or trying to loose a little weight before you put on a bathing suit on your upcoming vacation? The EatSmart Elite Digital Kitchen Scale will help with that. I was sent one in exchange for inclusion to the mother’s day gift guide. Monday of last week (5/1) I started trying to loose weight and I thought a scale would help me proportion my meals. I have only lost 1 pound, but hey, it’s a start! LOL I just need to get my willpower stronger! I also need mother nature to cooperate and stop going from HOT, which I don’t eat much, to COOL where I want everything sweet I can find! I made brownies for dessert during the week, because we were talking about CAKE and it was cool! See no willpower! The Precision Elite Kitchen Scale uses accuracy technology to allow you to weigh in grams, ounces, kilograms, and pounds. It has an extra-large backlit LCD screen for clear readings and the stainless steel platform is large enough to fit larger items such as a mixing bowl or even a package. I love that you have 2 different options to weigh your food. You can place food directly on the scale or you can put your food in a bowl or plate. If you are using a bowl or plate, press the power button once to turn the scale on, then press the power button a second time to activate the tare feature. The tare feature resets the scale to zero and will automatically subtract the weight of a bowl or plate from your measurement. This allows you to view the exact weight of your portion without worrying about the math. This is definitely my favorite feature! It’s so easy to weigh fruit, meat, etc. 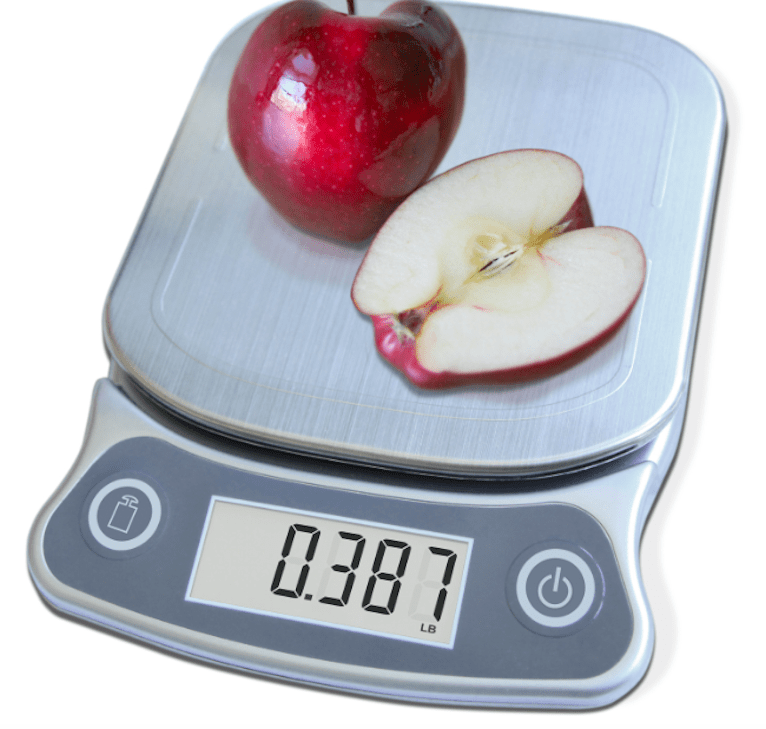 To save battery life, the scale also has an auto-shutoff time of 3 minutes. It’s a very light weight scale which makes moving the scale pretty easy especially when you are cooking. 4 AAA batteries and a Calorie Factor Booklet are included. The scale can weigh up to 15 pounds. If you sell online, you can also use the scale for weighing packages! That’s pretty awesome that the scale can do so much! 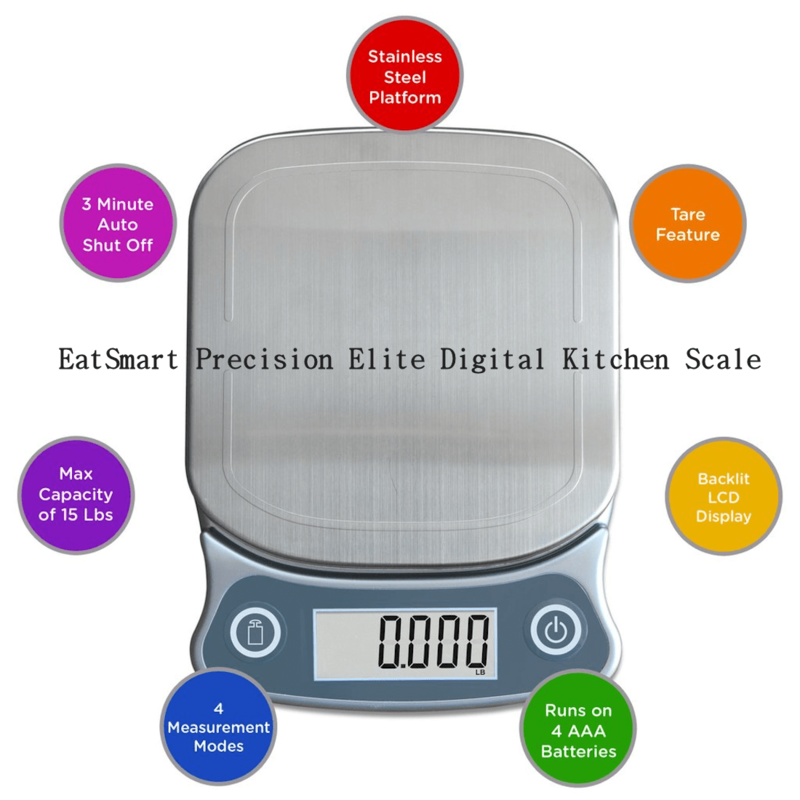 You can purchase EatSmart Precision Elite Digital Kitchen Scale on Amazon for just $36.95 (Reg. $69.99) with Free Shipping. 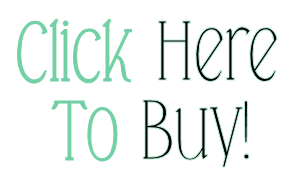 Be sure to check out the EatSmart Precision Elite Thermocouple Food Thermometer too! Website | Facebook | Twitter | Google+.